There aren't too many characters like Richard B. Riddick nowadays. He's an old-fashioned sort of anti-hero, whose amoral brutality is tempered by a code of honor. He was great in his first movie, but it turns out that antiheroes have a hard time supporting a franchise. As his new movie, Riddick, sadly proves. In a nutshell, Riddick is an okay movie. It's not as good as Pitch Black, or as fun as Chronicles of Riddick. The plot depends on everybody but Riddick being kind of a moron. The movie is two hours long, and ought to be 90 minutes instead. But there's some fun action, here and there, and enough goofy thrills to make it worth watching. Or at least renting. But my main thought, walking out of Riddick, was: I know now how to make an antihero work in a story. I know the secret of truly great antiheroism. Are you ready? It's the supporting cast. When you think of the great antiheroes in fiction and on screen, they're almost always surrounded by other people who are fascinating characters in their own right. Antiheroes work best when they're bouncing off idealists, scoundrels, loathsome bastards, and quirky weirdos. Like on Blake's 7, Avon works because you put him alongside Blake, Cally and Vila, and later Dayna and Tarrant. 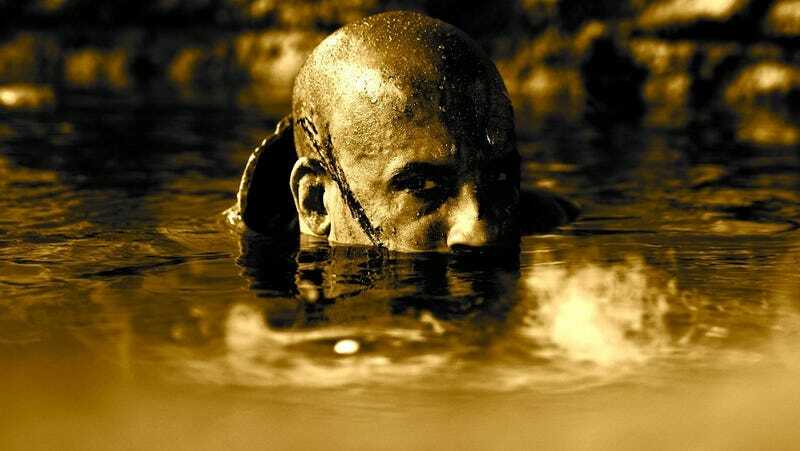 The good news is, Riddick is still fun to watch, even if he's basically doing the same things he did in the previous movies. Vin Diesel has the wry snarl down pat, and he always seems like he's having fun being the killer wiseass who deals death from the shadows. There's a standard sort of scene in these movies, which goes like: 1) Everybody understimates Riddick. They think they've outsmarted or outnumbered him. 2) Riddick says something cryptic, like "don't forget the anchovies," and everybody laughs at him. 3) Something dramatic happens, the tables are turned, one or two mooks die. 4) Riddick says, "I told you not to forget the anchovies," and suddenly everybody realizes that Riddick knew what was going to happen all along. This stuff never gets old. I can watch Vin Diesel smirking and bathing in the blood of stupid people for hours. Riddick is one of those characters whose superpower is being underestimated. And who tricks people by telling them the truth and not being believed, over and over again. That's a common trope with antiheroes, but Riddick plays it really well. And this movie does bring one new element to Riddick: weariness. He starts off the movie seeming kind of defeated and filled with self-doubt — for the first time ever, maybe — and even though he rallies once he's got some morons to chew through, he always seems a bit sadder and more defeated. Which is something it would have been nice to explore a bit more. As it is, seeing a more worn-out version of Riddick's swagger is actually kind of affecting, at times. And there's just a hint of an arc here, in which Riddick maybe regains a tiny smidge of his faith in human nature by the end of the movie, if you squint hard enough. There's the makings of a good story here, although it's kind of half-baked. As it is, a lot of this movie feels like Riddick's greatest hits, only slowed way down. Riddick displays one of the major signs of sequel-itis: Ideas that were tossed off the first time around, which were just something cool an earlier film threw in for giggles, are rehashed this time around, only much, much slower. Actually, the mention of Avon from Blake's 7 puts me in mind of the other lesson about antiheroes that Riddick teaches. In the first couple of seasons of Blake's 7, Avon is a supporting character who steals the show from the ostensible protagonist, Blake. It's only after Blake vanishes from the show that Avon starts becoming the main character, and it works for a while. But by the final season, Blake's 7 is becoming The Avon Show, and Avon is doing ever more exaggerated versions of his "hardened cynic" act, to the point of self-parody, and beyond. You can track his overacting by the size of the shoulderpads. Likewise, the problem with Riddick isn't just thinking that Riddick can carry a whole movie by himself, with no other memorable characters. It's also blowing up Riddick's schtick until it risks becoming too much of a spoof. Riddick was kind of cartoony in Chronicles, too — but here, his "smartest, deadliest guy in the room" thing actually starts to feel like a caricature. He's staggering under the weight of metaphorical shoulderpads. Bottom line: I liked Riddick just fine. It’s not a particularly great movie, but it has some fun bits. I have a feeling it'll grow on me, too. But it's a little too slow, and a little too keen to impress on us how great a character Riddick is, by rehashing his previous moments of greatness — while neglecting what actually made Riddick great: his interactions with other great characters.